Yesterday I had some Physio treatment done on my knee to ease the patella tendinitis. Today I was really tired for my training session as I worked before. My legs were really sore from the high volume of squats. However I still had a good session. I will take tomorrow off then hit the weights again on Saturday. 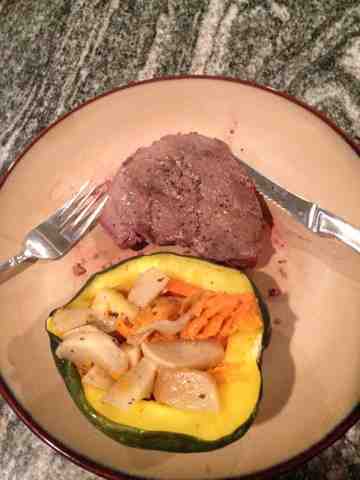 Dinner was deer steak cooked rare with carrots, parsnips, yams, potatoes, inside an acorn squash. Everything was delicious and healthy. My second day back training. Traps are sore from yesterday. I'm feeling pretty good though. As I progress through the session I notice I am a bit out of shape when the squats are taking place. Wow. 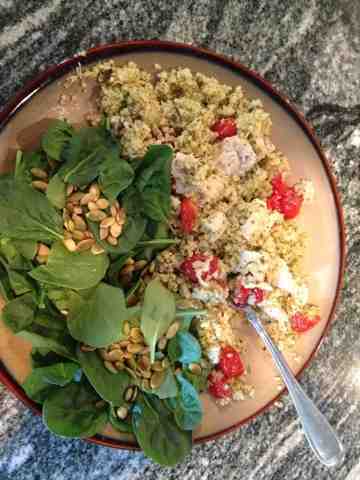 For dinner I had pesto chicken quinoa with cherry tomatoes with spinach and pumpkin seeds. I am going to start giving this a try every morning. After a long deserved week off from training I hit the platform for the first time in 9 days. Didn't feel to bad considering. Had a bit of minor pain that hasn't worn off from the wear and tear of a long training cycle. I Started working on split jerks today as my cleaning power has surpassed my power jerking power. It feels pretty good. 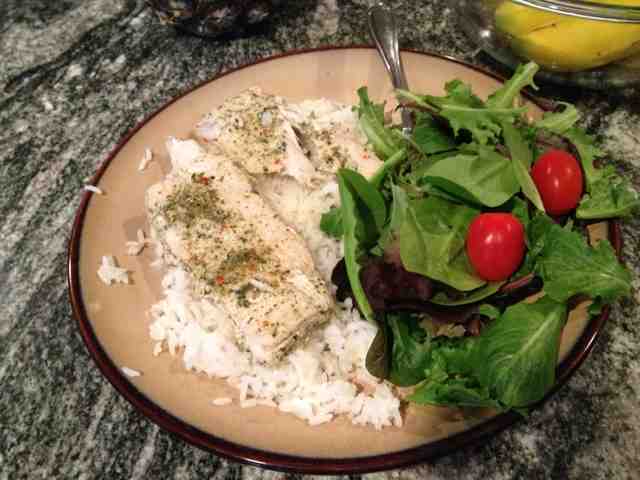 After training I had some Mahi Mahi fillets from Costco with basmati rice and spinach salad. It's always frustrating to total on paper less than your last competition. Especially since it is not due for lack of trying or effort. Maybe I trained too hard and didn't recover enough. Maybe I just had a bad day. 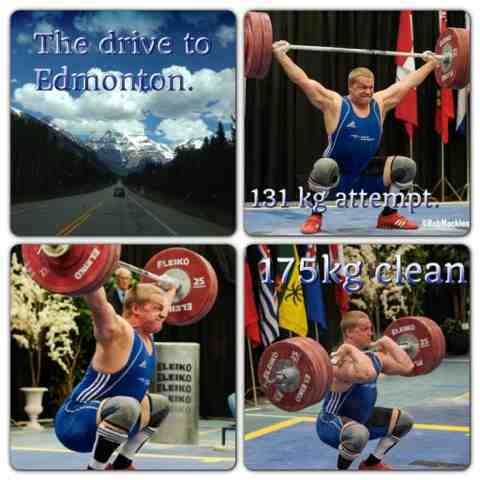 Whatever the case I snatched 126kg and clean & jerked 165 at this years Canadian Nationals. My personal bests are 136 and 170kg. So I was a bit off. However I did clean 175 kg but missed the jerk. It's a fine line between making a new PR and having a slightly worse comp than your last one. I will keep going and we will see what the next competition brings. Hopefully I can put the details together to make some new bests. Last session before Nationals on the 18th. Light and quick with a couple decent front squats. Had massage yesterday and Chiro today. Now to Eat like a horse and prepare mentally for all the work is done now. Felt like I was run over by a truck today. Worked through it. It was a light day. Light days help recovery more than taking the day off in my opinion. Keeps everything moving and circulating. And subsequent workouts are better after having a light session. Really tapering down this week. Worked out at the work gym today and forgot my chalk, good thing I was not going to max. Technique felt pretty good. Power was not at a premium level today though. Felt good today. Warmed up with some medicine ball throws then jerked up to 170kg. Feeling faster and more powerful. 1 week until nationals in Edmonton. Started out rusty and slow on snatches but as the weight got heavier I got in the groove. A little slow out of the blocks today. Feeling a little rust. By the end of my clean and jerks I felt in the groove. My technique felt sharp. Speed was decent. And strength is coming back around. 11 days until Nationals. Felt pretty quick and decently strong today especially since yesterday was max out day. Technique felt sharp. Test day for nationals today. Got my starting weights down. Ready to rock in 2 weeks. Technique is solid. Shooting for some new PR's in Edmonton.